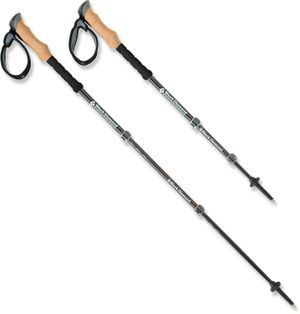 Trekking Poles/Water Shoes- my choice, black diamond alpine carbon cork trekking poles and fila skeletoes. Trekking Poles, like duct tape, have so many useful attributes to hiking. If there is any one piece of gear that I am rarely without at any given point, it would be my trekking poles. Trekking poles essentially give you 4 feet vs two and with 4 points of contact, your balance is improved significantly. 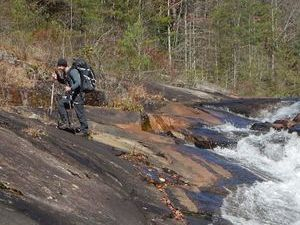 At no other point are trekking poles more effective than during river and stream crossings. If you hike to waterfalls long enough, your stream crossings will become more numerous and more difficult. Without trekking poles, I wouldn't be able to do 3/4 of the water crossings I attempt. From a bushwhacking standpoint, poles make great offensive and defensive weapons against thorns which grow upwards, sideways, and yes, they grow from the sky downward too! For long distance hiking, trekking poles allow you to engage your upper body reducing stress on your knee's and joints...Especially on long descents. With the addition of snow baskets, trekking poles are also great aids in snow hiking. About the only time I don't use poles is when climbing something that requires both hands. In that case, the poles collapse and stow easily to the outside of my backpack. Trekking poles generally come in 2 designs and are made of different materials which I will discuss in more detail. Design styles, the twist-lock vs. the external flip-lock. The twist-lock style of poles have been around the longest. Just like it sounds, the poles are adjusted and locked into place by twisting the poles. My experience with twist locks both personally and professionally is that they are more subject to slipping unexpectedly. The mechanism used to lock the poles into place is also more prone to the breaking of the moving parts. Better than 80% of returned trekking poles where I work are twist lock type poles. Flip-lock poles have a mechanism that flips closed around the pole. They are easier to operate, have a stronger holding force, and the tension can be tightened by the turn of a screw. Under more extreme force, the poles are still subjective to slipping, but much less than twist locks. Materials make the difference between cheap knockoff poles and higher end trekking poles. With trekking poles, you do get what you pay for. You can buy cheaper poles from Wal-Mart, Outdoor Products to be specific, for more than half the price of a decent pair of trekking poles from REI. Visually, they don't appear to be that different. The material used to make them however, is vastly different. The trunk full of cheap broken poles I have acquired from friends who learned the hard way serve as visual aid's for the hiking classes I teach. Cheap hiking poles are will bend easily and they will break. You can take my word for it or you can find out for yourself. Common Materials used for trekking poles are aluminum which is light weight. The more expensive and stronger poles are made from an aluminum alloy which has the light weight properties of aluminum strengthened by a mix of alloys. 7075-T6 aluminum is found in many of the stronger more durable aluminum trekking poles. Carbon Fiber trekking poles are the strongest poles out there. They also have a much stiffer feel. Carbon fiber trekking poles are also the lightest option available but come at a much steeper price. Expect to pay anywhere between 30-40% more for carbon fiber poles. Hand Grips are usually made from hard rubber, a dense foam, cork, or a combination. I've found harder rubber grips tend to get slick with sweaty hands and are more prone to causing blisters. Cork on the other hand does a great job of absorbing moisture and has been my grip of choice. Another feature on some poles I find incredibly useful is a drop down handle extension. This allows you hand to slide down and regrip the pole lower for steep climbs without readjusting the height of you poles! In the poles pictured above, the drop handle is the black foam below the cork grips. Adjusting Poles to the right height is fairly simple. Your arms should form a 90 degree angle at the elbow with the tip of the pole touching the ground and you hands firmly on the grips. Water shoes. I'm not going to spend a great deal of time talking about water shoes. I think personal preference plays a big role when selecting shoes for this purpose. 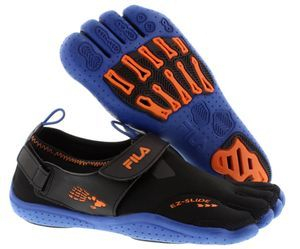 I will however take a minute to talk up the Fila Skeletoes which I stumbled on by chance. At first glance they look an awful lot like the Vibram 5 Finger shoes that were all the rage for about a year before people figured out they were over priced and not all that comfortable. There are two features that put the Fila Skeletoes in a league of their own. First, your two smallest toes share a spot so these are actually 4 finger shoes. This simple design makes them much easier to put on. For those of you without perfect toes or with one foot slightly larger than the other like myself, they accommodate that additional space without discomfort. The second feature is the padding built in at the heel and the ball of your foot. With the Vibram's, when you walked on gravel for example, you felt every single rock making them slightly better than barefoot but not by much. The skeletoes have enough padding that I can walk on them for hours on end and my feet stay protected and comfortable. What makes these shoes perfect for water is the sole of the shoe is very flexible, not a rigid sole like almost every other water shoe. The flexibility in the sole allows your feet to literally wrap around the entire surface area of a rock. The toes have enough flex that you can grip rocks with your toes. The loops on the heel and top of the foot allow easy on and easy off as well as a great place to hang the shoes on the outside of your pack with a carabiner. They weigh next to nothing and icing on the cake, they are inexpensive! I found them at Backroom Shoes in the mall for around $40. I like these shoes so much that I bought two more pair which live in my closest in case they quit making them!